Real Madrid assistant manager Paul Clement is set to replace Steve McClaren as Derby County head coach, BBC Derby Sport reports. McClaren was sacked on Monday following constant speculation about taking over at Newcastle, and Derby's failure to make the Championship play-offs. Clement, 43, has been number two to Carlo Ancelotti at Real since 2013 but the Italian was sacked on Monday. And Clement is now expected to take up his first managerial role this week. He began his coaching career with Chelsea in the 1990s and returned to the club in 2007. 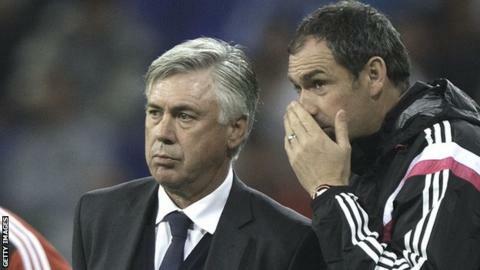 Clement started working with the first team under Guus Hiddink in 2009 and then became a prominent figure working with Ancelotti at Chelsea, Paris St-German and Real. Derby were leading the Championship in late February but won only two out of their last 13 league games and missed out on a play-off place on the final day of the season. Real won the Spanish Cup and 10th European Cup in the club's history in the 2013-14 season, but this campaign saw the Spanish giants knocked out of the Champions League semi-finals by Juventus and finish as runners-up to Barcelona in La Liga. Clement, the son of former QPR defender Dave Clement and brother of ex-Chelsea and West Brom defender Neil, was linked with the QPR manager's job when Harry Redknapp left the club in February. Meanwhile, chief executive Sam Rush has told BBC Radio Derby that there were a number of factors behind the club's decision to dismiss 54-year-old McClaren. "Steve has a super record and he did extremely well for us, particularly for the first three-quarters of his time at Derby," said Rush. "We sat down and talked about the vision for the club and what we're looking to achieve. While a lot of what we're looking to do Steve bought into, some of it he didn't. "Therefore, I think the decision was the right one."